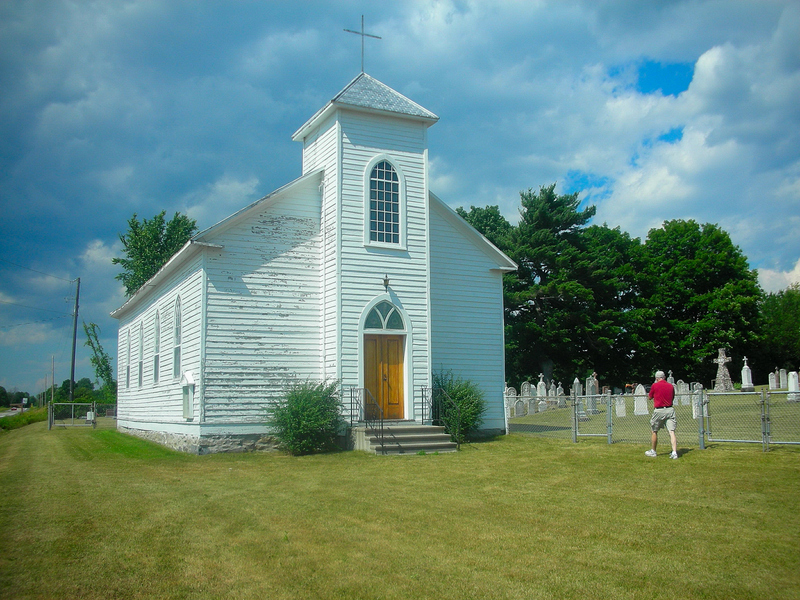 In 1856 St. Patrick’s church was erected in Ferguson’s Falls, on land donated by the Quinn family. The lumber for the church construction was cut from the farm of William Scanlan. It is one of the oldest Catholic missions in Ontario, and two of its own members joined the priesthood: Father Michael Stafford, son of pioneer Tobias Stafford and Elizabeth McGarry entered the priesthood in 1858. Also Reverend Edmund Quinn, son of John Quinn and Anna Byrnes entered the priesthood in 1947. Before St. Patrick’s was built, the local Roman Catholics had to travel to St. John’s Church in Perth, which was a long, difficult journey by horse and buggy, particularly in the long, harsh winter months. This photograph above shows my brother Roger Stafford entering the grounds of the cemetery at St. Patrick’s, July 4th 2012. Many of the early Roman Catholic pioneers are buried in this cemetery. Stafford, Richards, Quinn, McGarry, Foley, Holliger, McKittrick, Blair, Carberry, Kehoe, McCaffrey, to name a few. There were seven young bachelors who left Ireland at the same time, and during their voyage across the ocean they swore that they would stick together, and help each other in their new country. They pledged to stay only if they could carve out a life for themselves, and if not, they swore they would all leave together and return to Ireland. The Irish bachelors were Patrick Quinn, John Quinn, James Carberry, William Scanlan, Terrence Doyle, John Cullen and James Power. The bachelors cleared about ten acres of land about two miles from Ferguson Falls, and lived together in a rough log cabin that they had built together. They were given 200 acres of land each, in connecting sections, and each cleared their land and began to farm. They married local girls, and started families. The area where they lived was known as the Quinn Settlement. The story of the Seven bachelors was passed down through the generations. One week before Christmas, December 19th, 1968, “The Perth Courier” published an article celebrating the 112th Anniversary of St. Patrick’s Church. Patrick was a 5th century Christian missionary, and is the primary patron saint of Ireland. Early records show that Patrick was the first Bishop in Ireland, and is regarded as the founder of Christianity. It is said that Patrick converted the Druids to Christianity by using the clover, a plant which grew in abundance all over Ireland, to explain the concept of ‘the Father’, ‘the Son’, and ‘the Holy Spirit’. March 17th is known as the ‘Feast of St. Patrick’, celebrated around the world to mark the date that St. Patrick died. The day is marked by church services, and the wearing of green to symbolize the clovers or shamrocks implemented by St. Patrick, to teach the concepts of Christianity. Historically, the restrictions of Lent such as eating and drinking alcohol were put aside for the day, which in recent years gave way to the tradition of alcohol consumption as part of the celebration. The Celtic Cross (below) was often used in the grave stones and monuments of the settlers who had come from Ireland, like those who attended St. Patrick’s Church in Ferguson Falls. Michael Stafford was born March 1, 1832 in Drummond Township, and died November 12, 1882, age 51 at Lindsay, Ontario. He is interred at St. Mary’s Cemetery, Lindsay, Ontario. Julia was the daughter of pioneer Tobias Stafford and Elizabeth ‘Betsy’ McGarry Stafford. Three members of this family devoted their lives to the divine service: Rev. Father Michael Stafford, who was parish priest of Lindsay at his death in 1882, and Julia and Margaret, exemplary members of this Institute. Sister Mary Elizabeth, or as she was known in the world, Margaret Stafford, was descended from a strong Irish Catholic family. Her father and mother, Tobias and Elizabeth (McGarry) Stafford, in the Township of Drummond, in the Parish of Perth. She had several brothers, one, the Reverend Michael Stafford of the Kingston diocese, and later of Peterborough, was a great temperance lecturer and won the appellation of “a second Father Matthew”. Her younger sister, Sister Mary Vincent, who entered the Community a year or more before, predeceased her several years. Like all the family Sister was of a very large build, tall and strong. Her very appearance would command respect at any time or place. Born February 22, 1845, she entered the Novitiate at the age of 23 on November 21, 1868. She seemed very much older. She received the Holy Habit Dec. 13, 1869, and made Holy Profession May 31, 1871. In 1888 she was given charge of the men’s department. She took complete charge of the apartment. She ruled as one having authority. There was no questioning, no back answers or insulting words would be tolerated. There was a rule to be observed and it must be followed. The time of rising and retiring had to be observed strictly. Although she was strict, she was very kind. If anyone was sick or in trouble, she was always there to help. As a result she was loved and respected by all. Margaret Stafford (Sister Mary Elizabeth) passed away on St. Patrick’s Day, 1925. The former Theresa Quinn, born in Ferguson’s Falls, was one of a large family of boys and girls, including Sister Mary. Edward. She entered the Novitiate, on September 8, 1905. She served the church in Smiths Falls, Brockville and Lancaster. She was one of the original members of Rosary Hall, our first foundation in Edmonton, Alta. and spent her remaining years 1905-1949 caring for the sick at the House of Providence in Kingston. Sister M. James was faithful at all times, devoted to her work in the care of the aged and infirm brought comfort and joy into the lives of others by her cheerful nature. Sister Mary Edward (Rose Mary Quinn) was a descendent of one of the pioneer families who emigrated from Ireland in the early years of the nineteenth century and settled in Ferguson’s Falls. Bishop MacDonell, the first Bishop of Upper Canada, first offered Mass in the Quinn home when he visited the remote missions of his large diocese. Sister Mary Edward’s parents, James Quinn and Elizabeth McNaughton, raised eleven children and three of the children were called to serve the church: Sisters Mary James and Sister Mary Edward, and a grandson, Rev. Edmund Quinn. Rose Mary Quinn was educated in the local school, then attended Lanark High School and Ottawa Teachers’ College. She entered the Novitiate at St. Mary’s of the Lake on August 15, 1913, and taught in various schools in Portsmouth; St. John’s, Kingston; Smiths Falls; St. Mary’s, Kingston; Tweed and for thirteen years at St. Michael’s, Belleville. In 1946 she was appointed to Arnprior in Pembroke diocese, where in 1959 she completed a teaching career of almost fifty years. Originally known as Millford, Fergusons Falls was renamed in honor of the early settler Captain Ferguson when a post office was established there. This was the closest village to the Stafford farm on the 11th concession of Drummond, and was a source for supplies, postal services, blacksmith services, social activities, and later St. Patrick’s Roman Catholic Church. Thomas McCaffrey was the first settler, arriving in 1815. McCaffrey was a good friend of Tobias Stafford and Elizabeth ‘Betsy’ (McGarry) Stafford. Thomas was one of the witnesses to their marriage ceremony in St. John’s Church in Perth. He also signed his name as witness to one of Tobias’ later land transactions, and was present at the baptisms of some of the Stafford children. The early settlers not only faced the challenges of clearing heavily-wooded land, building a home, and providing for their growing families; they also dealt with hot summers, and cold winters. Some years had wet conditions, and some years they dealt with drought. As if that wasn’t enough to cope with; there were the storms….. Violent thunderstorms caused damage and sometimes total destruction to homes, barns and precious livestock. In the summer of 1897 Ferguson Falls farmer Thomas Haley nearly died trying to save his horses, when lightning struck his barn. In June of 1921 Ferguson Falls experienced a terrible heat wave, lasting more than three weeks. There are conflicting stories about a logging accident in Drummond Township that took the life of Jimmy (Phelan?) Whalen. Some say the accident took place in 1876, and some say 1878. What can be agreed upon is that Jimmy died as a result of trying to break up a log jam. Log driving was a popular occupation for spry, young men, who were agile enough to leap from log to log, or to coast down the river while keeping their balance on such a precarious vessel. A poem was written, and later sent to music, describing the ghost of Jimmy Whelan, and how he appeared to his lady-friend as she walked along the river bank. Weeping and wailing with many a sigh. Mourning for one who no mortal can save. Onward they speed over young Jimmy’s grave. And give me fond kisses that oft-times you gave. Cold was the body she pressed to her heart. Alone on the banks of the river below. “The Phelan family live in this district. The name is pronounced ‘Whalen’, locally. James’ brother Thomas, whom I knew intimately, died a few years ago. Regarding the James Phalen tragedy, John Smith of Lanark Village, an old timer and singer of the ‘come all ye’ type, wrote the words which I now enclose. He sings the Jim Whalen song with much pathos, and with that peculiar dropping off of the last word from a singing tone to a speaking voice. This style of finishing a song is used by sailors and shanty-men. I was fortunate in meeting an old shanty foreman, Peter McIlquham, well known on the Mississippi River for over half a century, who told me he was present at Jim Whelan’s death. The infamous ‘Stumble Inn’ was one of the three hotels in Ferguson Falls, located right on the shore of the Mississippi River, and is said to be one of the oldest buildings in the village. According to the lads who grew up in the area it was ‘the’ place to stop for a drink, before or after mass at St. Patrick’s Church. During the week, local men often gathered there to play cards in the evening, and on the weekends, helped along by a little (or a lot) of alcohol, there was singing, dancing and fiddle-playing. The Stumble Inn was also notorious for its fights, and it wasn’t uncommon for one or two of the lads to end up in the river before the evening was over. The original log school house was built around 1820, replaced with another log building in 1871, which was eventually constructed with bricks. The school remained open until 1968. That was the year when all students of the small, one-room school houses in Lanark County were sent to larger more centralized schools. Death Certificate of Ferguson Falls teacher Jennie Doyle, age 22. It wasn’t always easy to find a good, reliable teacher for the tiny school at Ferguson’s Falls. Below, is an ad that was placed in November of 1891. My Great-grandfather, Thomas Richards, served as one of the School Trustees. In November of 1893, my Great Aunt Mary Stafford was hired to teach at the little school. The article also mentions one of the Hollinger lads who had accidentally shot himself in the leg. Apparently there were some thieves in the area stealing livestock. The last mention is of Mary Stafford’s father Thomas driving his herd of lambs through the village, likely on his way to Carleton Place where they were put up for auction, or shipped by train across Canada or into the U.S. Some livestock were even loaded on ships and sent overseas to England. Another column, from November 13, 1896, highlights some of the activities taking place at that time in the village. A news column from December of 1897 mentions teacher, Mary Kehoe, and her plans for her Christmas vacation. Also interesting is that the local businesses have decorated their storefronts for the Christmas season. Near the end of the column is a mention of a “disgraceful scene” on the street on the previous Saturday evening, then a veiled reference which may or may not apply to one of the local Doyle lads who would have been living in the area at that time. By 1857, Ferguson Falls was booming. More than 400 people lived in the village. John Doyle was the Innkeeper, James McCaffrey was listed in the business directory as a Wagon Maker, John & M. McCaffrey were the local Blacksmiths. John Stafford, (Tobias Stafford and Elizabeth McGarry’s son) was the area Shoemaker, and would later open a shoe store in Almonte, then in Perth. There was also a sawmill, and a grist mill owned by Robert Blair and a hotel owned by Charles Hollinger. In 1909 the first telephone line was installed to serve the community around Ferguson’s Falls. Robert Blair built a dam across the Mississippi River which created the ‘falls’, in order to provide power for his two mills. As time went on, local lore tells that the water from the river backed up along the banks because of Blair’s dam, and caused flooding of the lowlands for the farmers located upstream. Eventually the dam was taken down. At one time there were three hotels at Ferguson Falls to provide accommodation to travelers passing on their way to Perth or Renfrew. The Log-Drivers who worked on the Mississippi were frequent visitors to the hotels. It’s been said that the floor at Charles ‘Charlie’ Hollinger’s Hotel had to be replaced each year due to the Log-Drivers dancing on the wooden surface, in their spiked logging boots. In 1890 Mrs. John Murray advertised her hotel for sale in the local newspapers. Left to Right: Elizabeth Hollinger, seated. Theresa Hollinger is standing, second from the left. Julia Hollinger McGarry is seated, and standing at the far right is Maria Hollinger. Theresa Hollinger Nagle – obituary from ‘The Ottawa Journal’ Friday, March 2, 1928. Murphy – Stafford Courtship Begins! In the fall of 1893, a dance was held – ‘Murray’s Ball’ – a very successful event, and it was during this time that my grandfather’s older brother Peter Stafford began to date the lovely Miss Mary Murphy. They would later marry, and have a large family. Peter was a stagecoach driver, and had a little ‘taxi’ service where he transported local folks back and forth between Perth and Lanark, and places in the surrounding area. In June of 1894 a lovely summer wedding took place at St. Patrick’s when Alice Closs married Anthony Vallely, ceremony performed by Father O’Rourke. If you’re in the area……………. St. Patrick’s Roman Catholic Church is set in a picturesque location, not far from the mighty Mississippi, and is a lovely spot to visit, and to reflect, on a warm, sunny day. We remember those who came before us, stood on these very grounds, celebrated baptisms and weddings, and mourned the loss of their loved ones at the funerals held at this small country church. It is well worth a visit for anyone with local connections, to spend some time at this historic and sacred place in Ferguson’s Falls.